Water heater leaks often occur without warning, creating a water damage emergency for homeowners. If you are experiencing a leaking hot water system, it is imperative that you contact a dry out professional as soon as possible to contain the situation and dry out all affected areas quickly to avoid further, more expensive damage. Pooling water and even moisture left to sit in dark places, such as within your ceiling or walls is a haven for mildew and mold growth. Tri-State Restoration Services is a local dry out specialist with a crew on the ready to handle your water heater emergency. Put our expertise and over 18 years in the dry out industry to work for you. Why Do Water Heaters Burst? There are three primary causes of water heaters breaking; build up of sediment, corrosion in the tank and too much pressure. The latter is the biggest culprit we see when we get a call for a burst hot water heater. Well-functioning water heaters have a relief valve that opens up when pressure begins to build in the system, but tanks wear down over the years and components can become faulty. When this occurs, too much pressure builds in the tank, leading to a burst or "explosion". Regular HVAC maintenance should be performed, but if you have an emergency, call the water damage pros at (513) 277-0857 for immediate action. What If I Have Water Dripping From the Ceiling? 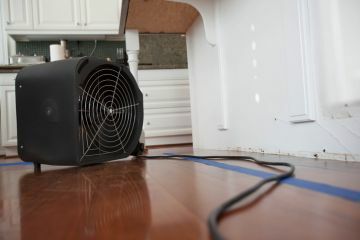 If you've had a large enough leak to penetrate walls and flooring, call Tri-State Restoration Services immediately to begin the process of drying out all affected areas and keep water damage to a minimum. If a good deal of water has leaked from your water heater, we may need to expose walls or floor boards to fully dry interior structures. The benefits of quickly drying all surfaces are prevention of mildew and dangerous mold growth, and prevention of costly damage in the future. Tri-State Restoration Services has cared for homes and businesses in the area that have suffered water heater rupture for over 18 years, and we've got a crew standing by to help you too. Simply call (513) 277-0857 for quick action.